Matrix Style Link Heat Buffer Thermal Spray is a lightweight mist formulated to control hair, without leaving behind greasy residue. 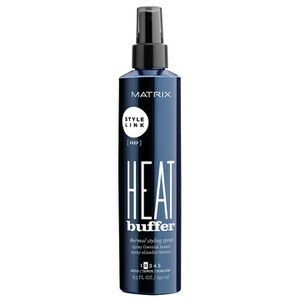 The thermal spray delivers a light hold and protects hair from heat damage (up to 450°F/ 232°C) caused by styling tools to give hair a smoother texture with enhanced shiny finish. Mist onto damp hair and style as desired. Esters/Va/Bis-Vinyldimethicone Crosspolymer, Octylacrylamide/Acrylates/Butylaminoethyl Methacrylate Copolymer, Vp/Va Copolymer, Peg-40 Hydrogenated Castor Oil, Parfum / Fragrance, Phenoxyethanol, Aminomethyl Propanol, Citric Acid, Xylose, Ethylhexylglycerin, Limonene, Benzyl Alcohol, Benzyl Salicylate, Linalool, Citronellol, Coumarin, Geraniol, Hydroxycitronellal, Citral, Isoeugenol, Eugenol.